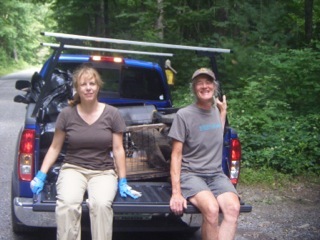 Headwaters’ second cleanup in the George Washington National Forest was again a huge success. 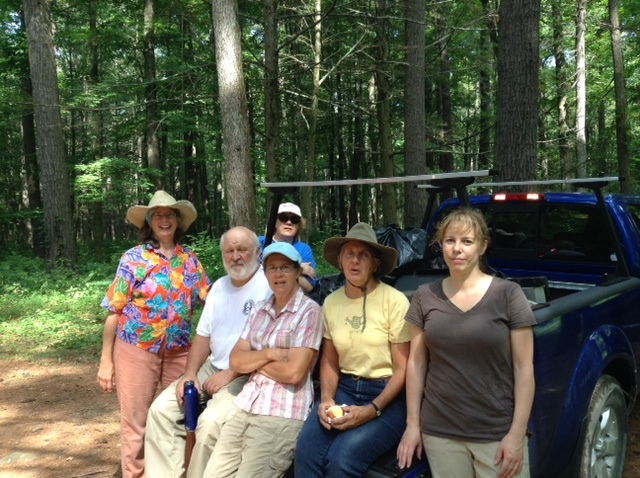 Several members – Adrie, Sandy, Gretchen, Ann, Judy, RoxAnna, and Tom – met at Todd Lake about 8:30 a.m. on July 14. 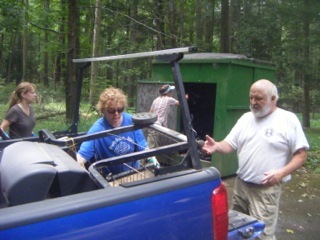 Rangers had provided large trash bags and the weather was splendid for outside work and activities. There are about a dozen “dispersed campsites” located along the Forest Service road between Elkhorn Lake and the Camp Todd historical site. Although these campsites have no tables, toilets, or other facilities, they get frequent use during spring, summer, and fall. Several campsites are actually a network of multiple camping areas located along the stream that flows into North River and eventually into the South Fork of the Shenandoah River. We also picked up trash along several miles of road between Elkhorn and Camp Todd. 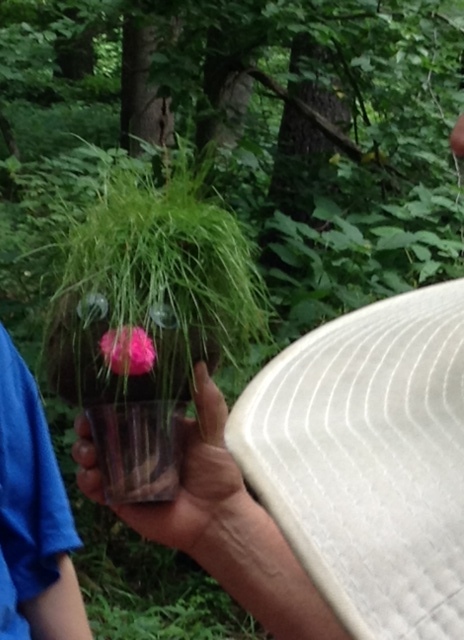 A unique find of the day: grass-haired guy. Since we had conducted a cleanup of the same area during the summer of 2013, our band hoped for a light trash run. However, rangers had assured us that heavy use of the area guaranteed us plenty to do – unfortunately the rangers were right. If anything, we collected more trash than last year, filling a pickup with huge contractor bags of cans, bottles, propane cylinders, broken camp equipment, children’s toys, and much more. Among the large items that didn’t fit in bags were a homemade porta-potty and a gutted gas grill. After depositing the trash in the Forest Service dumpster at Todd Lake, we enjoyed lunch at the almost deserted picnic area and talked about upcoming events and environmental issues facing the Central Valley. Also discussed was how best to convey a message of “pack-it-in, pack-it-out” and good stewardship to the folks that use the treasure we know as the George Washington National Forest. Because of the obvious need to keep the area and our waterways clean, the board agreed with the Volunteer Service Projects Committee that this cleanup will be an annual event. A gutted gas grill was among the truck full of trash. Gretchen and Adrie enjoy a tailgate ride from Tom. August 1, 2014 in Projects.